In early December 2012, the Big Year competition in which birders participated in finding the most birds in a year, was nearing its end. Birders were frantically finding the last birds for the year. One person in particular was missing a simple bird, the Oriental Pratincole. The last sighting of the Oriental Pratincole was in mid-November that year at a place called Punggol Barat, a reclaimed piece of land next to an airport. Bare earth, thin patches of grass with a small pond made for an ideal location for the pratincole. So on that sunny morning, the birder walked around alone to explore the place. With a lot of walking and a big dose of luck, he managed to see a pratincole sitting near a pond through his binoculars. It was a good find. Not wanting to disturb or flush it, he kept his distance and took some pictures instead, and left soon after. Being a fair birder, he decided that he will inform those that did not have the bird yet, so that they too have a fair chance of seeing it later. Afterwards, away from the unbearably hot sun, he sat down to have a closer look at the photos he took earlier. Immediately it struck him that he was looking at a Small Pratincole (Glareola lactea), a related but much harder to see species in Singapore. In 2012, social media was already used to share bird sightings and so he quickly sent out a mass Whatsapp message. At the other part of the island, I received the information. Without much thinking, I immediately dropped my work and drove off. I too was involved in the Big Year, and I have certainly not seen this bird before. The last time it came to Singapore in 1989, I was still schooling somewhere in Malaysia. Singapore was still a distant land then. This entry was posted in Birds, Nature, Wildlife and tagged Punggol Barat, Small Pratincole on July 8, 2014 by Francis Yap. 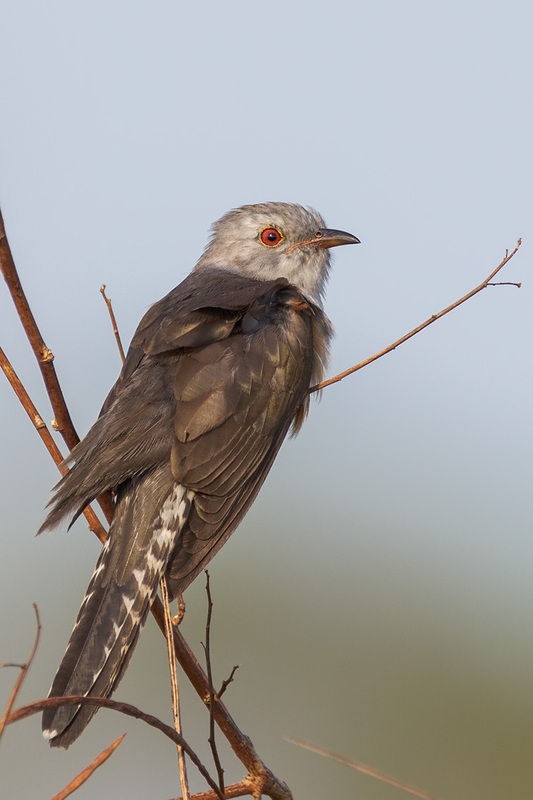 The Plaintive Cuckoo (Cacomantis merulinus) is an uncommon resident in Singapore. In the past it was called the Malayan Brain Fever Bird. The Malay name is “Burung Anak Mati” which translate to dead child bird. All these names refer to the mournful sounding call that the adult male use to attract the female bird. Although listed as uncommon, the male can be rather easily found during the breeding season if one recognises its call. And it can be found in many areas in Singapore. It is a brood parasite, with hosts reported including ioras, prinias, cisticolas and tailorbirds. Below are some of my encounters with the species. This entry was posted in Birds, Wildlife and tagged jelutong tower, Lorong Halus, Plaintive Cuckoo, Punggol Barat, Tuas Grassland on July 2, 2014 by Francis Yap. One of the feature of Singapore birding is that the places for birding are getting less and less, and those that pops up temporarily eventually will give way to development. Many of the mini patches of grassland that pops up are usually prior cleared land that is left temporarily untouched. These have finite lifetime as the land clearing is for developmental purposes. While the grass grows, birds come and make it their home. And one of the most easily seen and heard is the Zitting Cisticola (Cisticola juncidis). Although often overlooked, they are in fact interesting birds. Their name is derived from the ‘zit-zit-zit’ sound that they make in flight. Current status: Being developed into a train depot. Remark: The cisticola is holding a piece of material for nest building. This entry was posted in Birds, Wildlife and tagged Changi Cove, Jurong West St 22, Punggol Barat, Tuas Grassland, Zitting Cisticola on June 26, 2014 by Francis Yap.